At the Frankfurt Motor Show 2015 Lexus ruled it by introducing the Lexus RC F 2016. The model is built alongside the recently introduced RC Coupe and features a wider and sportier body with lots of aggression, both in terms of power and looks. 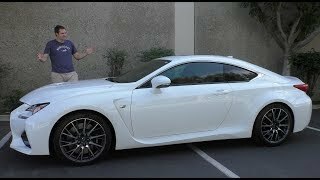 Let us have a look at the review of Lexus RC F 2016 to know more about it. The interior of Lexus RC F 2016 is created to support its sporty and powerfully engineered outer body. Inside you’ll notice a lot of leather and refined materials to give you smooth feeling keeping the durability intact. ‘F’ spec sports seats are mounted inside to give you perfect sitting and command over the electric steering wheel. You’ll also notice Alcantara spread around with blue/white contrast stitching adding a unique blend. The steering wheel provides marvelous control with its electrically boosted feature and this keeps the grip intact at both low and high speeds. 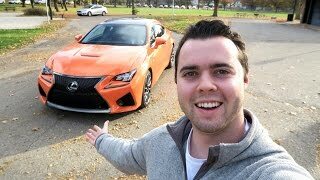 In all rounding up the interior details of Lexus RC F 2016 I would say it is totally driver oriented and side by side engineered to keep the safety and comfort of passengers. 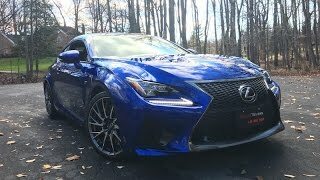 The exterior of Lexus RC F 2016 is truly mesmerizing. Starting with the front fascia you’ll be noticing the traditional spindle grille spreading aggression with its black mesh. There is one this special here and that’ll need your close attention. The mesh pattern over the spindle grille features ‘F’ motif which makes the model more special. The hood is raised a bit while the front fenders have large L shaped cooling ducts to supply fresh air to its menacing engine. Moving towards the rear end you’ll notice the massive 19-inch wheels fitted at the bottom, perfectly beneath those curved wheel arches. The rear end keeps the legacy, the sloping roof ends and enters the ‘Lexus’ logo right over the trunk lid. Both the rear fenders are integrated with slim taillights while a small ‘RC F’ logo could also be noticed close to bumper and at the bottom end of the trunk lid. In all the exterior of Lexus RC F 2016 is as menacing as the engine it hides beneath its hood. 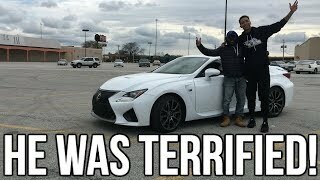 Beneath the hood of Lexus RC F 2016 is a 5.0 liter V8 engine generating total output of 467 hp and peak torque of 540 nm paired to specially tuned version of eight-speed Sports Direct Shift transmission. 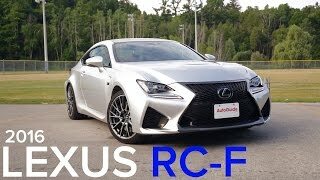 With this power the top speed of Lexus RC F 2016 could have touched more but it has been electronically limited to 168 mph while the 0-60 mph sprint can be knocked in 4.4 seconds.